Total NFL ratings through the first seven weeks of the season declined by 5% compared with last year and by about 15% versus the same stretch in 2015, which was a strong season for the league. The NFL has twisted itself into pretzels over this anthem issue, saying they think everyone should stand for the Star-Spangled Banner, but stopped short of declaring that this would become an enforced rule. In the third week of the season, ticket sales plummeted nearly 20 percent, while NFL ratings overall are down almost 10 percent over a six-week period. Since 2013, the league’s approval rating has dropped 18 percent. Once a reprieve in our daily lives, the NFL has now become one of the most divisive brands in the country. This was entirely avoidable. Colin Kaepernick, who fired the first salvo last year, sat and then took a knee during the national anthem. This year, scores of players joined once President Trump slammed their antics at a rally in Alabama last September. Many thought the tide was on the side of the league, which rushed to the players’ side, but everyone else thought it was nothing more that disrespecting the flag, our veterans, and those who continue to serve in uniform. Whatever issue these players were trying to shed light on was relegated to the trash bin. No one cares about your cause when you spit, or you're perceived to be spitting, on the American flag. 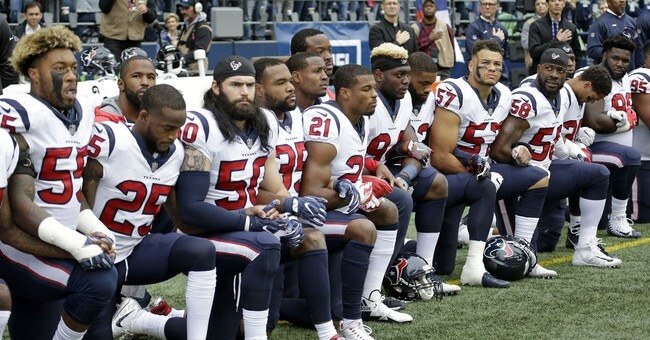 The NFL lost this war—big league. Whether the protests have actually impacted pizza sales for Papa John’s remains to be seen; they’re holding out on making a final decision until the end of this season. This is part of an overall marketing overhaul by the pizza giant.